We have been asked to give a brief explanation of the different dinosaurs associated with two famous North America rock formations. A comment on the different dinosaur faunas associated with the Dinosaur Park Formation (DPF) of southern Alberta and the Hell Creek Formation (HCF), which is mostly associated with the state of Montana but also outcrops in North and South Dakota as well as Wyoming. A typical view of the “Badlands” of the Dinosaur Park Formation. 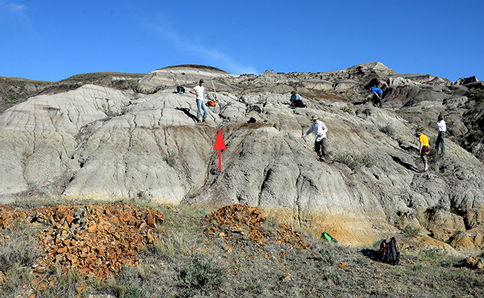 The red arrow in the picture highlights the layer in which the fossils of a new type of horned dinosaur were discovered. Both the Hell Creek Formation and the Dinosaur Park Formation are referred to as “Badlands”, this term is derived from the French phrase “les mauvaises terres” and dates back to the early years of exploration of these vast tracts of land. The term describes an area largely devoid of vegetation that is subjected to rapid erosion caused by wind, rain and running water. The DPF is older, the strata were laid down between 76.5 and 75 million years ago in the Late Cretaceous (Campanian faunal stage). In contrast, the Hell Creek Formation is younger. The rocks were formed at the very end of the Cretaceous (Maastrichtian faunal stage) and the strata records the transition from the end of the Cretaceous into the Palaeocene, the first Epoch of the Cenozoic. The HCF spans approximately 66.8 to 66 million years ago and documents evidence of an extra-terrestrial impact event preserved as a thin clay layer that contains large quantities of the rare Earth element iridium, marking the Cretaceous-Palaeogene boundary, representing an extinction event denoting the end of the age of the dinosaurs and the start of the Cenozoic. Prospecting for fossils – Hell Creek Formation (Montana). The strata that forms the DPF represents a coastal plan environment, crossed by numerous large rivers. The majority of the rocks are sandstones and mudstones, although there are layers of volcanic ash (bentonite), which resulted from the sporadic eruptions of volcanoes in the region. In the upper part of the DPF, coal deposits can be found (Lethbridge coal zone), representing deposition in a swampy environment. The sea gradually encroached onto this coastal plain and the area was eventually flooded, resulting in the deposition of the marine shales that represent the Bearpaw Formation that overlies the DPF. 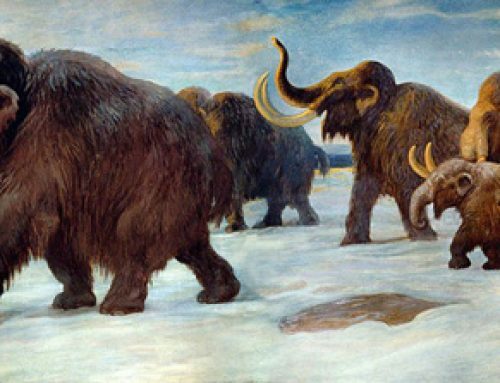 The Hell Creek Formation was created under similar circumstances. It too represents clays, mudstones and sandstones deposited on a delta, a low-lying flood plain crossed by many rivers. The HCF also has peaty, coal-like deposits (lignite), representing deposition in coastal swampy environments. Alberta around 75 million years ago (Dinosaur Park Formation). A Chasmosaurus and a Lambeosaurus feeding during the late evening, a typical scene representing the biota associated with the DPF. Triceratops was one of the last dinosaurs to evolve. A resident of the Hell Creek Formation. A Triceratops grazes next to a palm tree on the coastal plain that is represented by deposits that help to make up the Hell Creek Formation of Montana. Both the HCF and the DPF are famous for extensive dinosaur fossils. It is worth remembering that numerous other kinds of animal (and plants) are represented in the fossil record of these two formations. Although, the dinosaur fauna is similar between the DPF and the HCF, for example the terrestrial large herbivores are dominated by duck-billed dinosaurs and Ceratopsians, the genera represented are very different. In simple terms, the stage scenery might be similar and the cast of characters reminiscent but the actors on the stage are different. Typical dinosaur fauna of the Dinosaur Park Formation (Alberta, Canada). 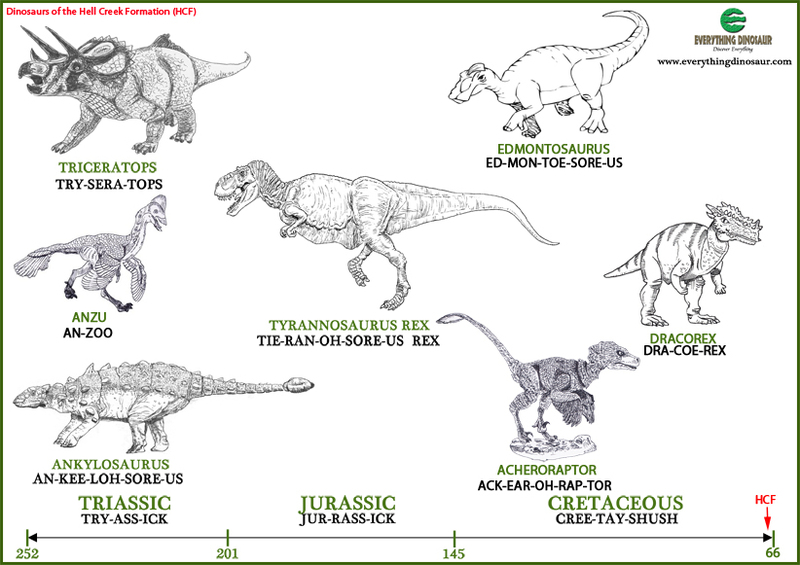 Typical dinosaurs of the Hell Creek Formation. We are looking forward to our visit to the Beacon Museum at Whitehaven (Cumbria). Everything Dinosaur will be taking visitors on a fossil hunt and we hope to be able to give away real dinosaur bones.